Cullen lives in a dull small town in Arkansas, where nothing interesting ever happens. When a birdwatcher claims that he has spotted an extinct woodpecker, Cullen’s small town is thrown into a frenzy and they forget everything else—like the fact that Cullen’s little brother has disappeared without a trace. Even though Cullen can’t help but imagine the worse, he would never guess the extraordinary truth behind his brother’s disappearance. Whaley’s debut novel is a fascinating blend of first person narrative, memories, and dreams, interspersed with separate chapters throughout the narrator’s story that tell a seemingly unconnected but vital part of the story. The novel is incredibly sharp, and Whaley writes stream of consciousness very well, but it is Cullen’s strong voice that really pulls the story together and keeps the tone consistent in this bizarre, thoughtful, and surprisingly humorous story. 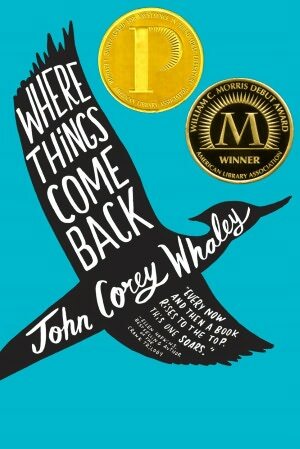 If John Green and A.S. King were to ever write a novel together, it might be something like Where Things Come Back. Cover Comments: I love the blue background and how everything is written on the bird's silhouette. Beautiful. Book purchased from indie bookstore! I'm glad you talked about WHEN THINGS COME BACK. This book has been on my wish list for ages. I totally forgot about it. That's the problem with having a 27-page wish list. BTW: I totally love Just One Day. LOVE IT!!!! Just One Year Blog Tour with Gayle Forman!